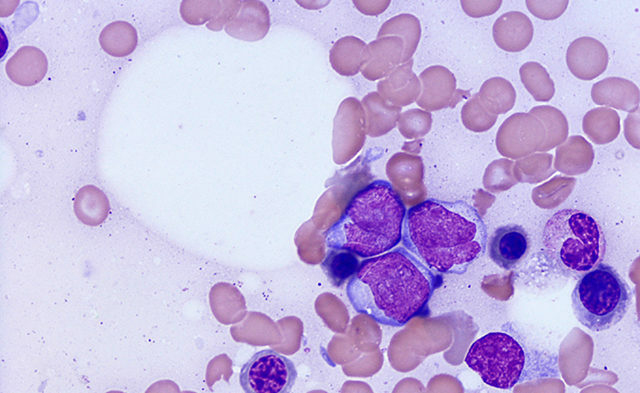 Ivosidenib is the first-in-class FDA approval for IDH1 mutation-harboring acute myeloid leukemia. Ivosidenib, an isocitrate dehydrogenase-1 (IDH1) inhibitor that works by reducing the abnormal production of the 2-hydroxyglutarate, is the first-in-class drug approved by the FDA for IDH1 mutation-harboring AML. The FDA based its approval on data from a dose-escalation and expansion phase 1 (ClinicalTrials.gov Identifier: NCT02074839) study, in which researchers treated 174 adult patients with ivosidenib at a dose of 500 mg daily. Sixty-three percent of patients were refractory to previous therapies, and 33% had secondary AML. Patients had received a median of 2 lines of previous anticancer therapies. At the start of the study, 110 patients required red blood cell (RBC) or platelet transfusions due to AML; after receiving ivosidenib, 37% (41) of patients did not require transfusions for at least 56 days. Of the 64 patients who did not require RBC or platelet transfusions at baseline, 59.4% (38) remained independent for at least 56 days. The most frequently observed adverse events included fatigue, an increase in white blood cell, joint pain, nausea, diarrhea, constipation, pain or sores in the mouth or throat, shortness of breath, swelling in the arms or legs, QT prolongation, rash, fever, and cough. The FDA also approved the RealTime IDH1 assay, a companion diagnostic tool used to detect IDH1 mutations in patients with AML. FDA approves first targeted treatment for patients with relapsed or refractory acute myeloid leukemia who have a certain genetic mutation [press release]. Silver Spring, MD: US Food and Drug Administration; Updated July 20, 2018. https://www.fda.gov/NewsEvents/Newsroom/PressAnnouncements/ucm614115.htm?utm_campaign=07202018_PR_FDA%20approves%20new%20AML%20drug&utm_medium=email&utm_source=Eloqua. Accessed July 20, 2018. FDA grants approval of TIBSOVO®, the first oral, targeted therapy for adult patients with relapsed/refractory acute myeloid leukemia and an IDH1 mutation [press release]. Cambridge, MA; GlobeNewswire; July 20, 2018. https://globenewswire.com/news-release/2018/07/20/1540182/0/en/FDA-Grants-Approval-of-TIBSOVO-the-First-Oral-Targeted-Therapy-for-Adult-Patients-with-Relapsed-Refractory-Acute-Myeloid-Leukemia-and-an-IDH1-Mutation.html. Accessed July 20, 2018.